A proper bite (occlusion) is just as important as having straight teeth, if not more. When teeth do not fit together properly, a person is more susceptible to excessive or uneven tooth wear, tooth fracture, periodontal disease, and temporomandibular joint (TMJ) and muscle pain, as well as headaches. Traditionally, orthodontists and dentists used bite registration film to evaluate contact marks on a patient’s teeth. These marks only show the doctor where the teeth made contact, though. They do not indicate how much force was placed on each mark, and there is no way to know at what point during the bite that the teeth contacted each mark. Drs. Carroll and Sutton utilize computerized occlusal analysis to do that. 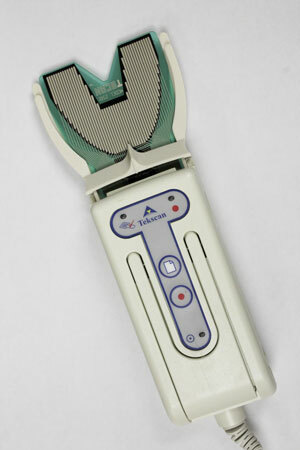 The T-Scan III is the only clinical diagnostic device that senses and analyzes bite-force contacts. A doctor first guides a patient into the proper bite position (known as centric relation) on to the ultra-thin sensor, and then through normal side-to-side and forward jaw movements. The doctor then uses the computerized analysis to locate interferences, as well as heavy and improper tooth contacts. These are corrected orthodontically or by minor reshaping of the chewing surfaces of the teeth. The result is a bite that is as healthy as possible. Dr. Carroll and Dr. Sutton also utilize the T-Scan when making occlusal orthotics (bite splints, night guards) for patients suffering from TMD pain and headaches.